Jesus told his disciples a story to teach them the importance of staying connected to him. Jesus used the example of a vine. The vine is a plant with a lot of branches growing out from it. The branches have fruit on them, the branches should have grapes on them. Have you ever seen a branch that has been broken off of a tree or a vine? It withers up and dies. Can it ever have any fruit on it again? No! Jesus said, “I am the vine and you are the branches. If you remain in me, you will have much fruit, but apart from me, you can do nothing.” (John 15:5) Jesus wants us to produce a lot of fruit. Good fruit like being kind, generous, and faithful. Most of all, he wants us to love others as he has loved us. Can we do that on our own? No way. 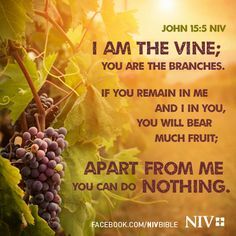 Just as the branches must be connected to the vine before they can produce fruit, you and I must stay connected to Jesus to produce the good fruit that God expects of us. Dear Father, help us to remember that we need to stay connected to Jesus if we are going to produce the kind of fruit you expect. In Jesus’ name we pray. Amen. Great reminder to keep in mind every day as we go about life. Its easy to give into the flesh and temptation, but we need to listen to our spirit which guides us to do what is good and what is right.